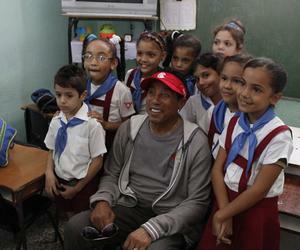 The prestigious American singer-songwriter and record producer William "Smokey" Robinson Jr., also traveled to Cuba, excited about its people and music, as part of the delegation of the President's Committee for the Arts and Humanities United States. "I am very proud to be here as part of the first President's Committee to come to Cuba since the visit of Barack Obama. For me it is a wonderful thing, an honor," confessed Smokey. "I'm learning about Cuba, it's my first time and if it depends on me will not be the last," he said laughingly, while predicted good times for recording collaborations in the field. About his passion for Cuban music he said that since childhood he listened to Cuban jazz, which is why he concluded: "I would love to record with Cuban musicians, I love music made here long before my visit." In the next few hours, the President's Committee on the Arts and Humanities United States will participate in talks with Cuban civil society, artists, intellectuals and students, at the headquarters of the Ludwig Foundation of Havana.